Regardless of where you live, having a pond means you run the risk of attracting native predators looking for an easy meal. Ponds are attractive areas to a variety of flora and fauna. In addition to your pond fish, other animals are likely to pay your pond a visit – some may simply be passing through, others (like salamanders, frogs, some waterfowl, and so on) might make it their home, others may just want to grab a drink, and still others may find that your koi look particularly appetizing. Whether your pond fish are small or large, young or old, even in wholly urban areas they face risk of predation. However, doing some research and getting to know the predators that are present in your area can go a long way toward protecting your fish. Online research, contacting animal control, and contacting local biologists or fish and wildlife departments can all help you to gain a better handle on what’s present in your area and the threat they may (or may not) pose. Once you know the predators in your area, you can begin implementing safety measures to keep your fish safe from them. Here, we will break down U.S. and U.K. koi and goldfish predators into three groups: high risk, medium risk, and low risk, based on the likelihood of them seeing your fish as a tasty meal. What defines “High Risk”? 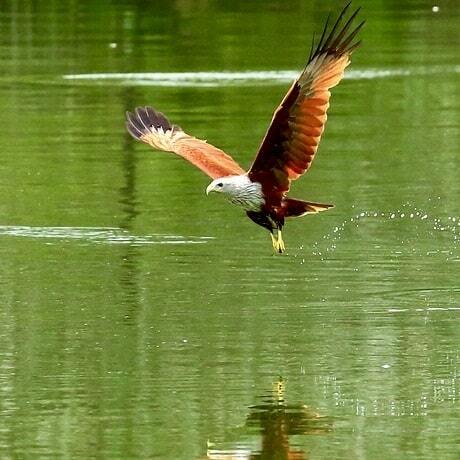 – High risk predators are those that are known to prey without hesitation on pond fish, including koi and goldfish. 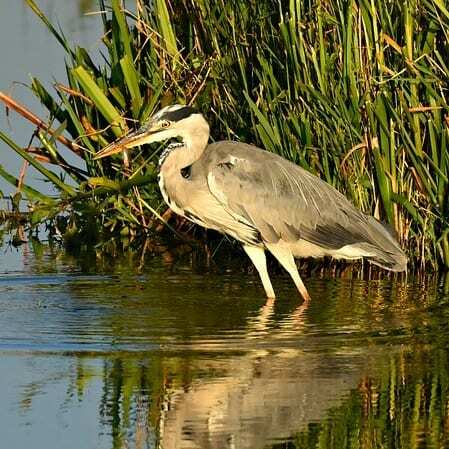 Well known in the pond industry, herons (of all species, whether grey herons, smaller green herons, or large great blue herons) will prey on koi or goldfish readily and voraciously. Their keen eyesight, many times stronger than ours, is able to zero in very quickly and efficiently on prey. Their eyes have both telescopic vision (so they truly can literally “zoom in”) and macro vision (the latter of which is what we have, except ours is weaker). Their reflexes are incredibly fast, rendering them able to dive and catch fish adeptly, and their long legs mean that they can simply wade into ponds that are too shallow to dive into. 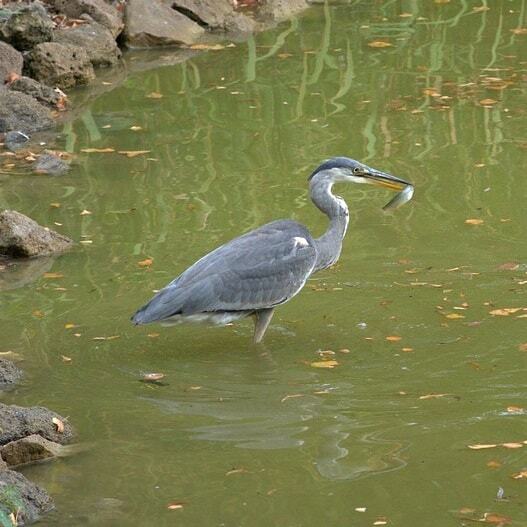 Long beaks make snagging koi, goldfish and other species of pond fish a breeze. In urban areas, both domestic and feral cats are the most common koi & goldfish killers. Millions of years’ worth of evolution and adaptation has made them excellent stalkers, waiting just out of view of your koi until they relax and swim about, then pouncing on them. Sharp claws and quick reflexes are able to capture even the quickest pond fish. 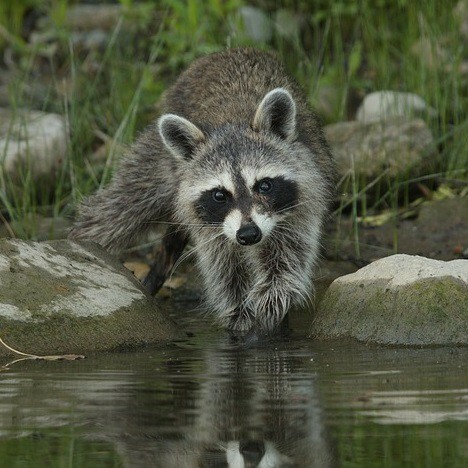 Raccoons are very opportunistic creatures, and as generalists they are found widely in both urban and rural areas and won’t hesitate to eat just about anything, from pond fish and berries to trash and roadkill. They’re also very crafty, not shy of getting their hand-like paws dirty or wet, and those hand-like paws make them excellent at grabbing and gripping things, even slippery fish. They’re more likely to visit small and/or shallow ponds, as diving isn’t something that they prefer to do. They’re also smart enough to know that spawning time is the easiest time for them to catch your fish, as they are moving about a great deal and not paying attention to much else during this time. What defines “Medium Risk? – Medium risk predators are those that occasionally prey on koi or goldfish, but generally don’t actively seek them out or pose a substantial or persistent threat. These guys could be placed in either the high, medium, or low risk category – if you live in a city, obviously otters won’t be plentiful. In urban edges (that is, places bordering both urban areas and natural areas) near rivers, they pose a moderate threat as they may decide to wander to your pond but likely won’t due to human presence and activity. 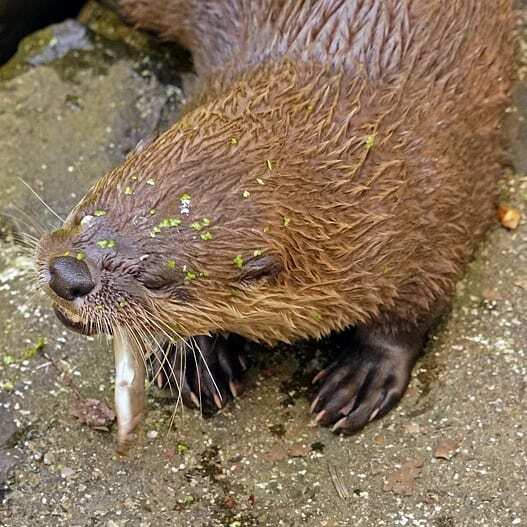 In fully rural areas in the country near rivers, otters have been known to sneak about at night at feed on koi and goldfish, making them a high risk predator in these areas. Since most people live in either cities or semi-urban areas, otters are overall considered a medium risk. Not surprisingly, otters are fantastic, fairly silent swimmers also with hand-like front paws and long, sharp claws and strong jaws, so making a meal of your fish is no problem for them. 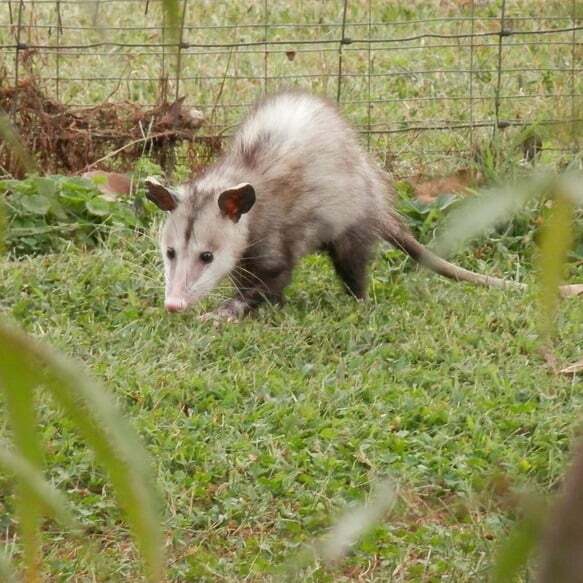 Like raccoons, opossums are well-adapted generalist species. They often get a bad rep, but a single possum can eat hundreds of ticks in a single day, making them crucial in controlling the spread of diseases such as Lyme disease. However, despite their perhaps fearsome appearance, possums don’t much like confrontation and tend to be lazy – they’d rather scavenge than anything else. Nevertheless, they have been known to prey on pond fish now and again if the opportunity presents itself; they are, at their core, true opportunists and will eat just about anything that presents itself. So if they happen to wander through your yard, don’t be surprised if they eyeball your pond once they see it (though they have notoriously poor eyesight, which also makes catching fish a challenge). Take note, though, that possums are not found in the U.K, but rather are only in North and South America. The U.K.’s approximate equivalent would be the wild hedgehog; these are considered little to no threat to larger fish, as they prefer much smaller fish on the rare occasions that they eat fish at all. In terms of pond fish predation, these primarily include hawks and owls, both of which have even better eyesight than herons and are incredible at scooping up fish with their hooked talons. Hawks will tend to be more active during the day, and pose more of a threat if you live at the edge of a woodland or forest or in an open area such as savannah, as different species of hawks prefer different habitats. Owls are similar and depending on the species also prefer either woodland or open grassland habitats, but obviously prey at night. Owls in particular are silent killers, their wings making next to no sound as they fly and swoop, so your fish are less likely to notice them coming and be able to hide. These birds tend to prefer small mammals, though, and while they have been known to prey on koi and other pond fish, fish aren’t usually a consistent staple of their diet. Snakes are listed as medium risk because most won’t attempt to feed on large adult koi or goldfish, and most wild, native snakes in the U.S. and U.K. aren’t overly large so they’d have a hard time eating fully grown fish. The grass snake is the largest snake in the U.K., still only growing to about 100 centimeters, or 3 feet, and preys primarily on small amphibians like frogs. 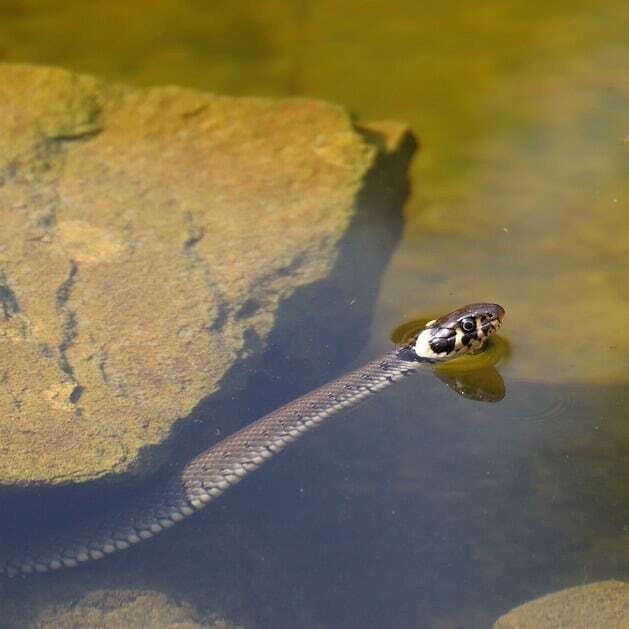 However, snake species that are found near water (including the grass snake) are known to occasionally eat koi eggs as well as small, young fish, and pose the greatest risk around both spawning and hatching time. What defines “Low Risk”? – Low risk predators are those that very rarely feed on koi or goldfish. Generally, these species will only do so if other prey is scarce and they’re really in need of a (relatively) easy food source. Whether your own domesticated dog or a wild species, such as coyotes or foxes, canines can prey on fish, but usually don’t. They’re not as quick or crafty as cats or birds, and most don’t prefer hunting in water, either. The exception to this could be a dog that has been trained to retrieve waterfowl or fish for hunters and anglers, such as the German short-hair pointer – such breeds of domesticated dogs may have more of an instinctual drive to go after pond fish. However, generally speaking, most canine species aren’t a substantial threat to your fish unless, again, they’re really in need of food. On rare occasions, some frogs and turtles may prey on koi or goldfish, particularly younger fish or smaller varieties (e.g., fancy goldfish). Frogs will tend to more so consume the eggs, while more ambitious turtles that are able to strike quickly (such as snapping turtles) may eat both juvenile and adults if the fish are slow and/or unaware enough. More often than not, though, they’ll stick with eating the insects, snails, and even algae in your pond as opposed to your fish. Regardless of whichever predator you suspect is eating your fish, there are ways to protect your fish and prevent their possible predation. 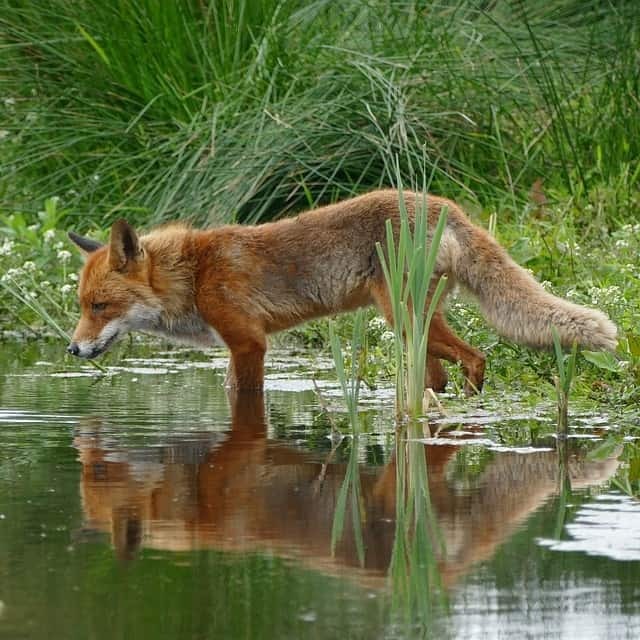 Fences, or even simply raising the edge of you pond above ground level, will help deter some predators. Raising the edge will help keep out smaller potential predators, like turtles. Fences will work for some larger species, and even some birds if it’s placed right along the edge of the pond and therefore prevents easy entry and exit by swooping aerial predators. Foxes, cats, raccoons, and dogs can all climb or jump fences, so another option is an electrified fence that will give them a small, quick zap – enough to scare them away and keep them from coming back, but not enough to cause actual harm. Alternatively, simply adding a durable and strong pond netting will help deter some of the most common and dangerous predators, such as herons and birds of prey. Decoys, such as wooden or ceramic decoy herons, work well to keep aerial predators away (particularly other herons, as they’re territorial and aren’t as likely to stop by your pond if they think another heron is already there). For species like raccoons or cats that are slyer and will likely catch on that the decoy isn’t real, there are motion detector decoys available, as well as larger predator decoys, such as alligators and coyotes. Automated decoys will activate and move about and make noise once a predator moves within a certain distance of them, and are more likely to scare them away, where as larger predators will work best against more stubborn hunters. In cases where critters are really proving to be a detriment to your fish, traps (preferably live traps) can be used on some species like possums, raccoons, and even cats. If these animals keep returning to your pond and repeatedly eating the fish, it may be time to completely relocate them. Live traps are not harmful to the animal, can be baited to draw the animal(s) in, and can then be transported far enough away that they’re not likely to return to your pond after being released. You should first check with your local wildlife authority to see if this is legal, and also make sure that the animal doesn’t have any young, as relocating it will doom its young to death. Alternatively, you could attempt to catch and relocate both the adult and babies/young, but this could cause significant stress to the young and may also kill them. Also be sure to only relocate the animal to an area with suitable habitat for them – be sure to take a few minutes to learn which areas the species prefers. With all of this in mind, traps should be your last resort due to the potential negative ecosystem impacts. Dogs, so long as you either know they won’t go after your fish themselves or are kept on a line where they aren’t quite able to reach the pond, are great at deterring predators. Simply smelling a dog will be enough to keep most predators away, and for the gutsier ones hearing it bark and/or growl is likely to keep them away. If you have more than one dog, the impact is greater. Keep in mind that dogs may not keep owls away, though. If you don’t have a guard dog, an alternative is to create the illusion that there is a predator, such as a dog, in the area by marking the garden and around the pond with an artificial scent. These work very well in areas were smaller animals are subject to predation from larger species, such as coyotes or foxes. While incorporating some form of tunnel or shelter for your fish into the pond may not necessarily deter predators, it will provide your fish with an easy, safe place to escape to that most predators won’t be able to reach. If your fish successfully hide enough times, it’s possible that some raiders will stop visiting your pond as it’ll become a waste of their time and energy that could be spent on easier food sources. Alternatively, you could place a radio or some speakers near your pond and play music, podcasts, anything loud with human voices. Most wild animals are afraid of humans, and hearing this will cause them to keep their distance, unless you’re in an urban area and the animals that are around are already habituated to human noise and activity. Wind chimes may work as well, or anything that makes sudden noise that isn’t too consistent – just like with us, if animals hear a noise often enough that doesn’t really change in overall pitch or sound much, it’ll just become white noise to them and won’t scare them. You could also make use of more advanced systems, such as automated predator sprinklers or ultrasonic noise repellents – both of which can work well to deter many predators from calling you garden home.